Manchester United first-team coach Gary Walker has tweeted confirmation that he’s set to leave his position at Old Trafford after 11 years. Despite not perhaps being the biggest name on the Red Devils’ books, Walker has been with the club for over a decade, working as a fitness coach with the first-team. 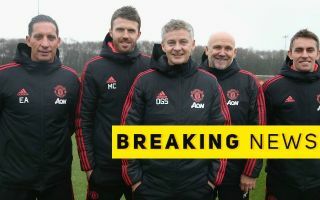 This won’t be ideal for Ole Gunnar Solskjaer, who is expected to become the new permanent manager of Man Utd imminently, with a report in the Mail claiming an announcement could be made this week. The Norwegian tactician has worked wonders at United so far, but has done so with experienced club figures close to him like Mike Phelan and Michael Carrick. It is by no means clear that Walker is a key part of that close-knit group, but one would imagine MUFC could do without making more big changes to their backroom team. All good things must come to an end. After 11 years, the time has come to leave this great club. I’ve had some amazing experiences @ManUtd and made some incredible friends and memories. A huge thank you to all of the managers, staff and players that I have worked with ? ?